Bugsby’s Reach, about one-mile long runs from Blackwall to the beginning of Woolwich Reach. The bearing NNW ands SSE. There was and perhaps still is a spot on the river known as Bugsby’s Hole. There was a robber of that name who had a cabin there in the midst of a bed of osiers to which he used to retire after his depredations and it being apparently impervious Bugsby remained there for a length of time but being at lest discovered to escape the vengeance of the law he cast himself into the Thames. On exploring the haunt much treasure was found and the place was ever after called ‘Bugsby’s Hole’. Sir – In regard to the article in your last issue ‘Bugsby’s Hole’ by Mr. F.W.Nunn. As an old Bugsby’s Hole boy I have always been led to believe that Bugsby’s Hole took it name from the ‘Hole’ which was the best water in the reach for ships to anchor when unable to get to their discharging wharves through tide and weather. The hole is a little to the north of the landing causeway there or abreast of the Electric Works. There are several reaches in the Thames with ‘holes’ Limehouse hole, Ropery hole – abreast of Messrs. Hollicks Cement works East Greenwich, Church Hole Erith, almost of Erith sweep, Erith reach and Aveley Hole just above Purfleet. All having the best water for anchorage of ships in those parts of the river about 70 years ago. I am sir: H.Kennard, 7 Milton Place Gravesend. WHEN I find that the antiquarians of London’s River have failed to find Mr. Bugsby I am encouraged to expound my views on the origin of the name “Bugsby.” It might be conjectured that Mr. Bugsby should be sought for in the title deeds of the landowners of the district still called in Bartholomew’s Atlas of London “Bugsby Marshes, Greenwich, S.E.10.” That is where the name originated. But I do not think they will find Mr. Bugsby there. I once asked the late A. G. Linney who Bugsby was, and he gave me the seemingly obvious answer that he was a man, but I do not think he was right. I see that on p. 62 of “The Lure and Lore of London’s River “he suggests that he was a market gardener. I do not think that is right, either.” His marsh would be the poorest place for market gardening, and it is not shown as such on any map. But let us get back to ancient history. I give a table of the names of the reaches in 1588 set against those of the present day. You will notice that several reaches have changed their names and Bugsby’s was then Podd’s Elmes. Podd’s Elms were a group of trees to the west of Woolwich; as they must have been well grown in 1588 they could not have lasted much longer, and it is unlikely that they survived the great storm of 1703. The common people of the 16th century lived in a holy terror of bugs, i.e., spooks, and where were they more likely to meet them than on that bleak marsh fringed around with corpses on Blackwall Point? Therefore, I think they called it “Bugs Marsh,” but they were illiterate and were unable to write it. In the 17th century a new bug made its appearance. It originally meant beetle, and still exists with that meaning m the compound maybug, cockchafer. It had quite a different origin than the bug meaning spook; it is generally supposed to be derived from an Anglo-Saxon word. It was used by entomologists for various insects and their larva, and nearly found its Waterloo when it was adopted as a euphemism for louse. It was banned by polite society, but those being less so continued. In the early years of the 19th century people, other than the sailor folk and the tough fellows going to the Colonies to seek their fortune were using the lower reaches. There were ladies going to join their husbands in India and many were going only as far as the Kent Coast to spend a summer holiday. These people would naturally be interested in the history and names of places they passed on their journey. As proof of this we have guide books and a panorama that were published at the time. I have a small sketch of Blackwall Point published in one of these guide books in 1831. The corpses have gone, but not very long since; for the gibbets are still there- and they would not last long in that sodden ground. The gibbets would naturally excite the Interest of these passengers. The map-makers were the first to realise that they could not call the marsh ‘Bugs Marsh’ so they made it into a surname by adding “by”. There are plenty of surnames which end in “by” many of them originally nicknames. I used to think that Mrs Humby, who challenged Theodore Hook to find a rhyme to her name and lost her bet, was an invention, but I found three “Humbys” in the directory. Saxby is a genuine place name. “By” was a Scandinavian farm. There are plenty of English ‘bys’ – Darby, Nobby, Libby, Bugby – all these from the directory, and many more. So why not Bugsby? Bugsby’s Marsh first appears on any map I have from 1822. In the guide book of 1831 previously mentioned it makes its first appearance on the River as Bugsby’s Hole. Linney seems to think that Bugsby’s Hole and Bugsby’s Reach were two different things; but they were not – thev were the same. Bugsby’s Reach does not appear before 1815. 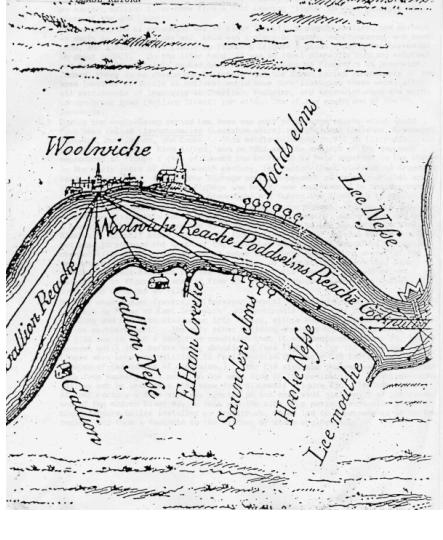 Raife Walker’s Map of 1796 makes the reach an extension of Woolwich Reach and: several other undated maps do the same. But why Hole? I have done my full share of guessing. I leave this riddle to someone else. (Cockpull Reache is only the very short stretch of the River past Blackwall Point). Author marymillsPosted on July 31, 2013 October 24, 2014 Categories Bugsby and Riverway, Document, Roads1 Comment on Who was Bugsby? ?